Made by a Fabricista: Just in Time...a Summer Jacket! I hope your summer is warm and sunny! In my neck of the woods, it seems to be struggling to stay in tune with the date on the calendar....warm then cool, blazing hot one day and then a cold front from Canada sets in and bam, it feels like fall! 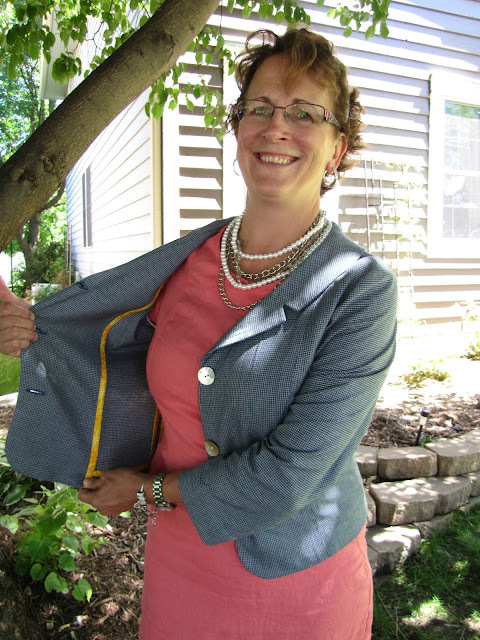 This little jacket from Kwik Sew to the rescue! 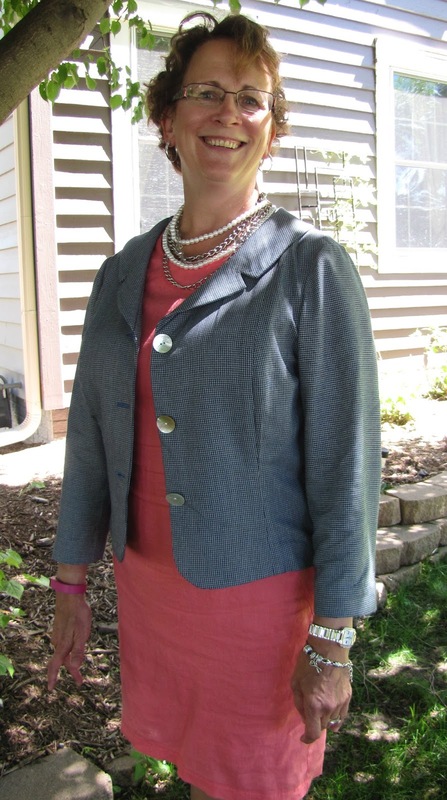 I choose a rayon suiting fabric that I just love! It was heavenly to work with. I love how the checks/plaid is woven into the fabric, not just stamped on. Fabric Mart has some lovely suiting fabrics out there and I haven't been disappointed in any of them! Now, off to find a pattern for summer as a layering piece that coordinated with many pieces in my closet and Kwik Sew 3334 was the winning choice. 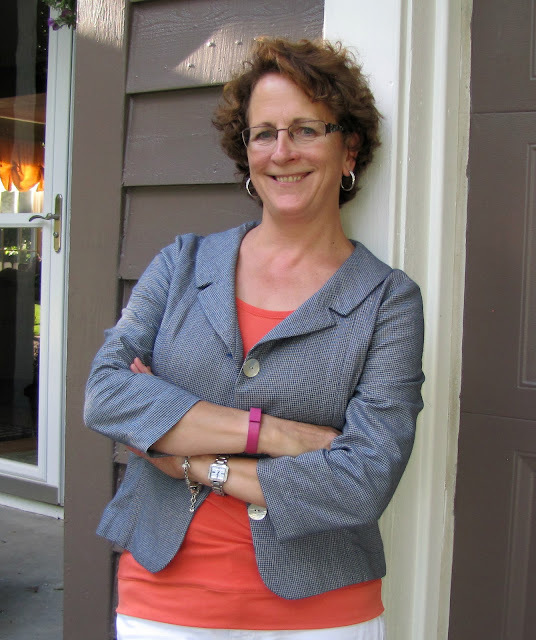 I just love the bracelet-length sleeves and the notched collar. I thought it would be perfect. 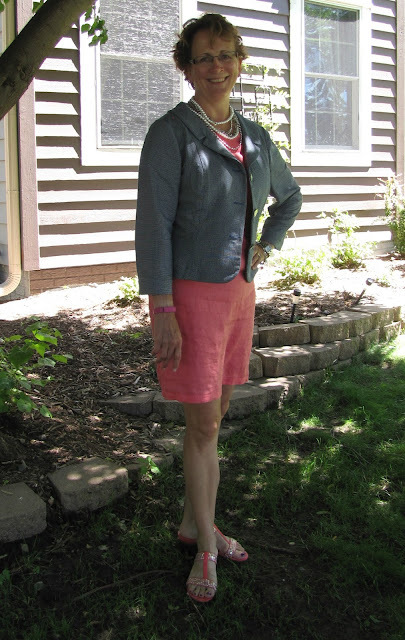 This little jacket took less than two yards of fabric so it was very economical to sew. I was very concerned about trying to match the pattern but since it is so small, it was super easy. Of course I modified this a bit. But first an aside to explain my changes. I am taking a class on Craftsy from Kenneth D. King on making a jacket and he recommended a few things that I decided to incorporate. First was to staytape the edges of the garment NOT cut on the straight grain: for example, the armhole areas and neckline. I simply used HugSnug seam binding that I've had in my stash forever and it worked great. It didn't add any bulk to the seam, is invisible from the garment's right side and according to Kenneth, will extend the life of the jacket--score! This little jacket is unlined and I simply didn't want to just serge the seams. I decided to use a contrasting cotton for the Hong Kong finishes on the inside since I wanted a pop of color that could be visible when I moved just right and I think I achieved that! This bright orangy-yellow was also from my stash. I cut one strip for each seams and applied before constructing the garment. Seriously, this took about an extra 30 minutes and I think the results were well worth it! I even added the bias trim to the sleeve and jacket hemlines, although those to locations were added after construction. I just love my little jacket! 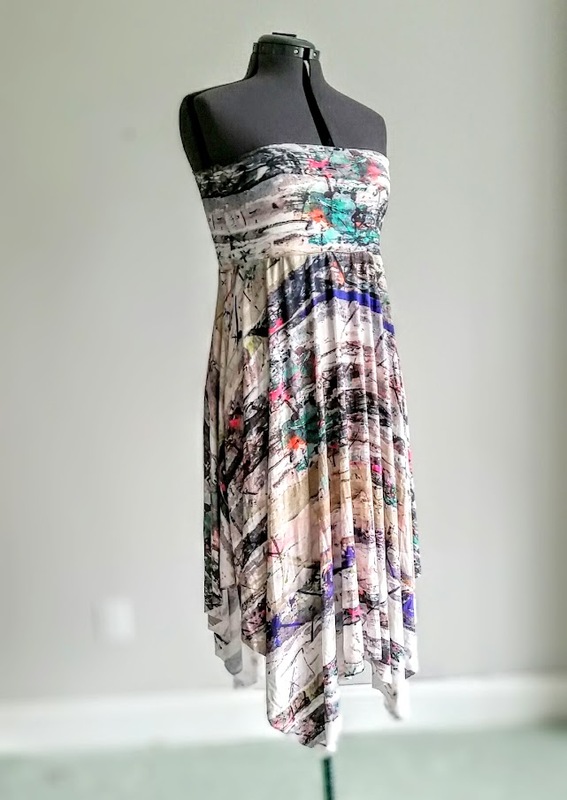 It is such a great layering piece and works well with so many other clothing options in my closet. I needed this jacket! Have you ever heard of a convertible skirt? 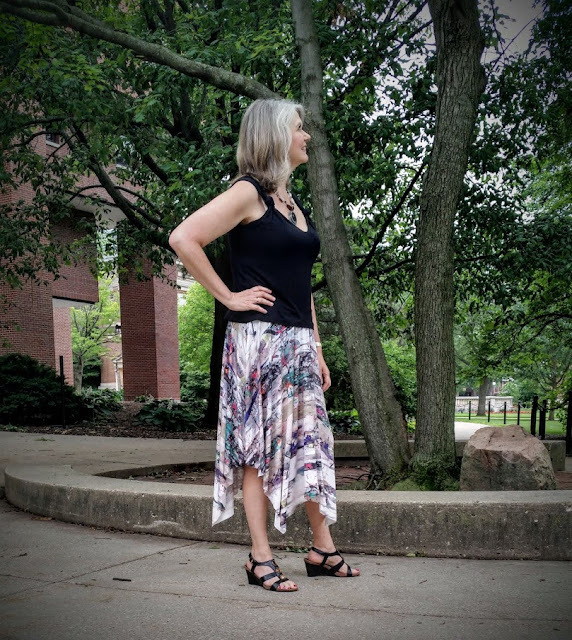 It's a skirt that doubles as a strapless dress. The waistband is like a yoga pants waistband that folds over as a skirt, and then you unfold it and pull it up higher if you want to wear it as a strapless dress! And here it is as a skirt on me! The pattern is New Look 6379. 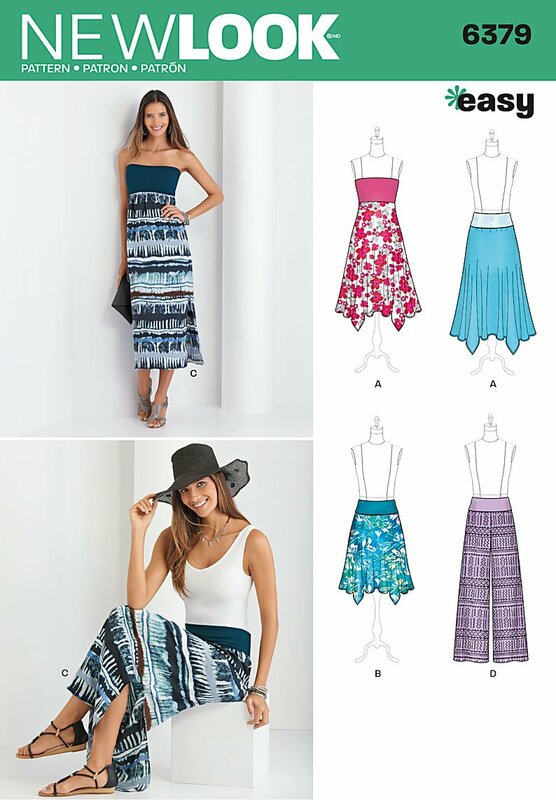 It is a super easy pattern with just two pieces for the skirt- the waistband and the skirt itself. You can make the skirt straight or with the handkerchief hem, and I decided to try the handkerchief hem to have fun with the stripe of the knit. The rayon knit is very stretchy, so I did need to cut a couple sizes smaller than normal. 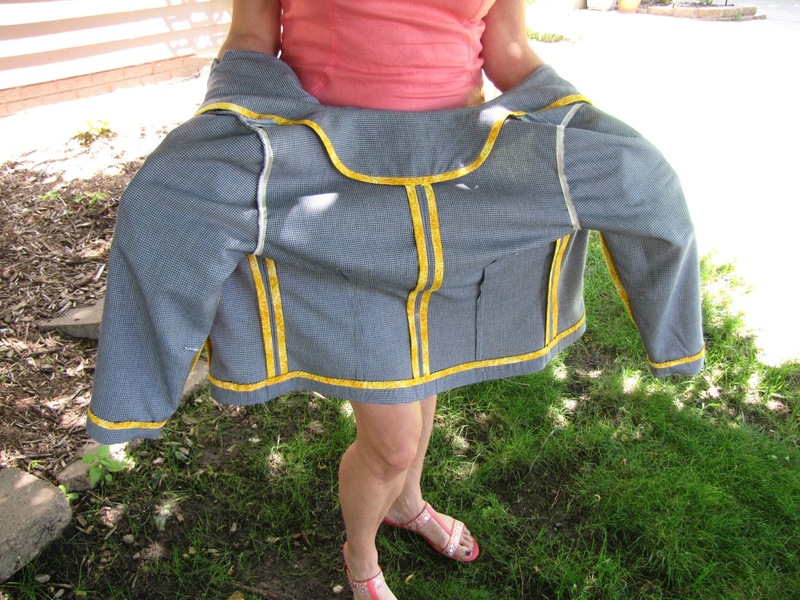 There is elastic in the waist, near the bottom where the skirt attaches to the waistband. This helps to secure it as a skirt, but does nothing to secure it as the dress bodice! I'm pretty sure that if I wore this as a dress, I would be constantly worried that it would be falling down. So, if you try this pattern as a dress, I'd recommend sticking with a fabric that has a high lycra content, and great bounceback- something like a swimwear or active wear fabric might be a better choice! I knew that I wanted to wear this with a black tank top, and found this pretty pattern in my Burda magazine from July of 2007. If you have this issue, check it out! It's a fun tank with a twist. I made it using a jet black rayon jersey from Fabric Mart also. I also made a white tank version, but it looked a little too pajama like, and I decided that I liked the black version much better. The construction is very clever. The front has very long straps that you knot and then attach to the back. 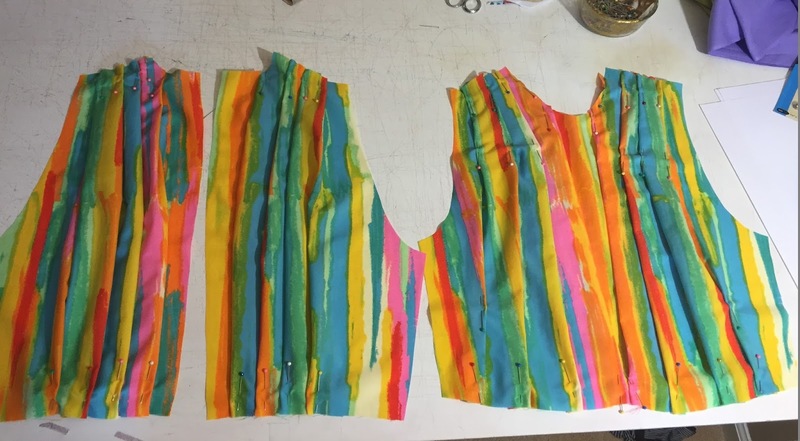 You cut a second front piece that ends just below the bust, and this serves as a facing for the strap, neckline and armhole area of the front. Really, really fun to sew! I did not hem the skirt. With knits that don't ravel, hemming is completely optional. I think that the raw edge is a more modern finish, and goes well with the abstract art fabric design. You can kind of see the stripe more clearly in the sitting pose here. 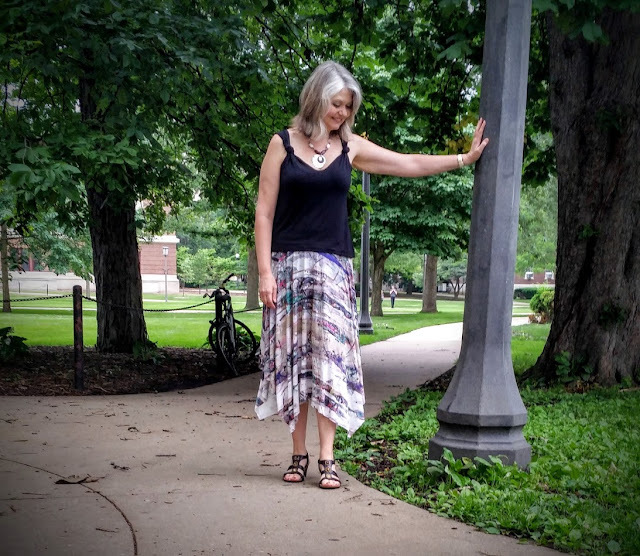 Have you tried making a convertible skirt pattern? Although I probably won't be wearing this as the dress, I really do like it as a skirt, and will be making more! 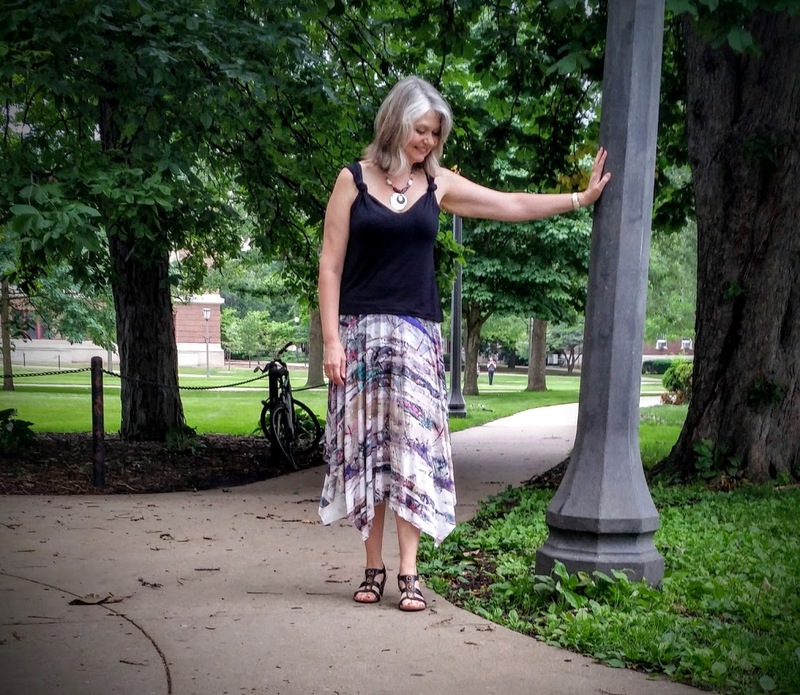 It's super quick and easy, and great for a skirt with a little something different. It was my 25th anniversary last week and every year I buy my husband at least one card for our anniversary and this year was no different. I looked at typical anniversary cards, "I'm Sorry" cards (for all of those times I said something I shouldn't have, uh-hem), "I Love You" cards and "You're My Best Friend" cards. I settled on an "I Love You" anniversary card but I knew I wanted to give him something more....it is our silver anniversary after all. I decided to make him a shirt. I realize it's a bit "Little House on the Prairie" for Ma to make Pa a shirt but he loved the last shirt I made him so much I knew it was the perfect gift. I found a beautiful quality Japanese shirting from Fabric Mart that he would like. It's a 100% cotton blue/gray fabric with tiny red & cream colored stripes and a really soft face. He's an artist so he's usually in a crew neck t-shirt and Levi's (with a little bit of paint on them somewhere) so this crisp but not too crisp fabric is great for my casual dressing guy. Already in my stash was the Negroni pattern from Colette but I had yet to make it. My husband has these particular two shirts he likes from Patagonia, so I decided to steal one from the closet and use it for the basic fitting specs. I measured it against Negroni and found the large was only a 1/2" different around the body so I went with it. I made a few fit and design changes starting with shortening the sleeve. I measured the shirt from the neck, across the shoulder seam and down the sleeve to get the length I wanted. I then measured the yoke and sleeve pattern pieces, deducted the seam allowances and found my sleeve needed to be shortened a little more than an inch. 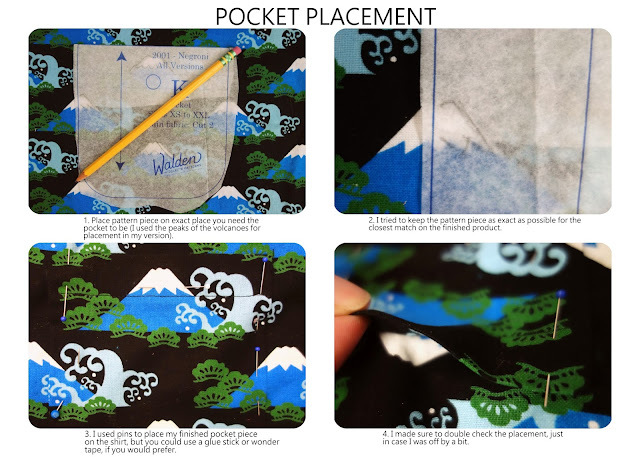 I copied the Patagonia shirt pocket because it had a lot more interest and used my 1/4" foot for the inner stitch and my ditch foot for the edge stitch when topstitching on the pocket, collar, yoke and sleeve. Negroni calls for a shirttail hem but I changed it to a straight hem with a side vent. The instructions were well written, the finish on the inner yoke and collar was really clean (take a look at the inside in the photo below) and overall it looked more like a ready to wear shirt than any other men's pattern I've used. Since I gave it to him as a surprise I wasn't able to do fittings while making the shirt so I will make a couple of changes next time I make it. 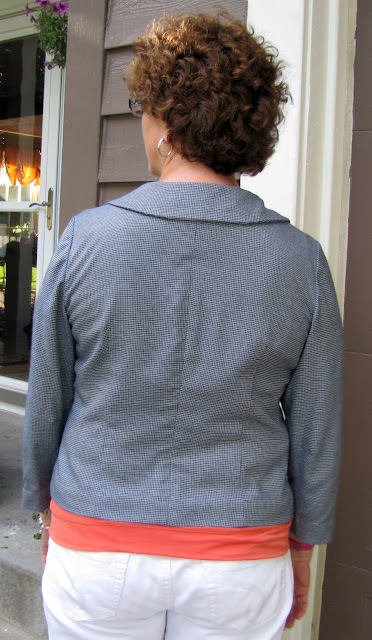 I'll shorten the sleeve and shirt length by an inch each and make a sloping shoulder adjustment to eliminate the wrinkles at the back armhole. My husband loved the shirt (and wants another one...I'm so happy!) and after some coaxing agreed to be photographed but insisted I leave his face out of it. I obliged because if I didn't I'd have to buy an "I'm Sorry" card at our next anniversary. While making this shirt I was reminded of something. When a new niece or nephew is born in the family, my husband gets freshly showered and puts on a collared shirt before we first go meet the baby. I've never asked him to do this and of course the baby doesn't know he's in his "Sunday Best" but I find it so endearing. Maybe we need a new niece or nephew in the family. Made by a Fabricista: A Volcanic Negroni! He did love it, though, he just had that one minor issue. Side View. The length on this shirt was just right for his 5'11" frame. He has a longer torso with shorter legs (my legs are actually longer than his and I am three inches shorter than him) and this shirt gave him more than enough length. I tried it on and it was long. I could wear it as a tunic if I wanted! So if you have a man you are sewing for with a long torso, I highly recommend this one. I did the hem up 1 inch, btw, not the 5/8" suggested by the pattern. The hem is slightly rounded at the side seams, not a big deal, but it did require me to ease in the excess hem material when hemming it up. Back View. The pleats at the back are nicely drafted, but I think I may have made them too big, so there was more yoke left over than there should have been at the armscye seams. I made it work, but I think I was meant to make those pleats a bit more shallow. My husband has a relatively small frame, so it fit him fine, but be careful of that if you are working on a shirt for a man who has less wiggle room overall. I like the fit a lot. 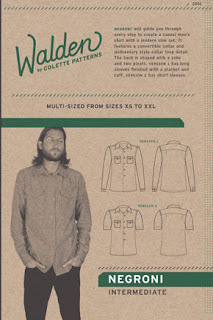 Most patterns for men have ridiculous ease built into them. I have another camp shirt pattern that has something like ten inches built into the pattern at the chest. I mean I know that men like things loose, but we aren't making a winter coat that has to fit over bulky sweaters here! I would have even liked to try making this pattern smaller (and will definitely make his next version smaller through the waist and hips). I know he won't want anything smaller than a medium, but if your husband prefers a more slim fit, go with the true size, and you will have a slim cut for sure. Full Item view. Normally Fabric Mart carries apparel fabric, and while quilting cotton can be used for apparel items, it usually gets sniffed at as inappropriate for garments. I personally love quilting cotton for clothing, partially because I love printed fabric and quilting cotton has the best patterns out there (barring Liberty of London), but I also love the fact that these can be washed and worn a gazillion times and still look fresh and tidy. I almost exclusively sew for my boys in quilting cotton, for instance. I also know that if my husband washes these items and then puts them in the hot dryer, they will stand up to all the hard washing and drying. My items made from more proper apparel fabrics usually require me to wash them and line dry them, so for my sanity, I make many from quilting cotton so I can have my husband do some of the washing. He will likely wash this with his clothing but then line dry it since he doesn't like to dry his clothing that is "nice" in the dryer. That will allow this shirt to stand up to wear even better. The colors and print on this fabric are very clear, well executed, and vibrant. It is a Japanese cotton, and from what I have read, the Japanese quilting cottons are prized. It is the typical 44" width, so keep that in mind if you plan to use it. This pattern required nearly 2.5 yards of this fabric. Placket Detail. The pattern is well drafted and goes together very nicely. I did find the sleeves didn't set in flat as nicely as the directions said they would, but I also chose not to do the flat-felled seam there (I did do another thing suggested by the pattern, that is in the next photos). I ended up with excess ease on the sleeve, so next time, I will lightly ease up the sleeve cap by adding a row of gathering stitches. It won't require much easing, but will make for a better sewing experience. I found the pattern, while it came together nicely, didn't have enough match points at the seams. When you are crafting a pattern with a very visible repeat like this one (it is almost like I was sewing with stripes), you need those match points. Mine turned out great, but I spent a lot of my sewing time on the cutting stage to ensure the seams would match up at proper printed placement. Because this pattern makes up a very 1950s/1960s kind of shirt, I decided to go for buttons that look like "wood," as many Hawaiian shirts of that era featured wooden or coconut buttons (some still do). The effect is kind of cool, the dark background with the lighter colored buttons makes for a striking appearance. I found these buttons in my stash, I believe they were from a Fabric Mart button bundle from a few years ago. :-) If I had made this in the lighter version of the Volcano print, like what I made my dress from (at the bottom), I would have used coconut buttons for contrast (if I could find them, of course). Crazy Burrito method for enclosing yoke. This pattern suggested I enclose all the seams of the yoke on the machine. I have only ever made yokes that involved me hand-stitching the bottom bit to the under bit, so I was a bit surprised they suggested this. I was SURE it wouldn't work for me, but some wrangling of fabric and many minutes making sure I wasn't sewing fabric that wasn't supposed to be sewn, and voila, success! A full yoke, completely enclosed by machine sewn seams. I will definitely be trying this in the future on all my shirt yoke projects. Very cool. The directions are adequate, but I feel like you have to read them very carefully to "get it." Detail of enclosed yoke from the back looking up on the inside. All in all, I am so glad I made this for him. Usually he figures out what I am getting him (grr) or he doesn't really like what I get him (double grr), so to be successful on both counts is a minor Father's Day miracle. He did get it early (Father's Day is June 21! ), but early is better, and helped me with the surprise. Yay! And because I am me, I couldn't resist making a matching dress for myself from the other color of this fabric, also available from Fabric Mart. I like the black version, but my skin tone looks horrible in black, so this cream works so much better for me. 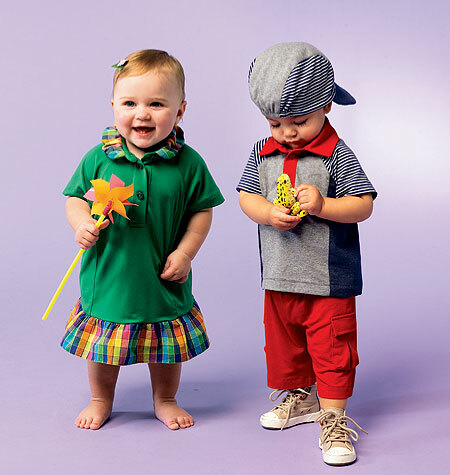 The children's clothes are cut, but not sewn. I promise to send Fabric Mart a photo of all of us in our gear when I do finish them and can get us all together for a photo. Although I plan on writing more on the construction of this dress at my blog next week sometime, I want to at least let you know some details on it just in case you were wondering. Because the cotton is Japanese, I thought using one of my many Japanese Pattern Books would be a perfect fit, so I sat down and figured out which one would allow for the print to be front and center, AND would not have so many seams that I would get a headache from trying to match up all the volcanoes properly. 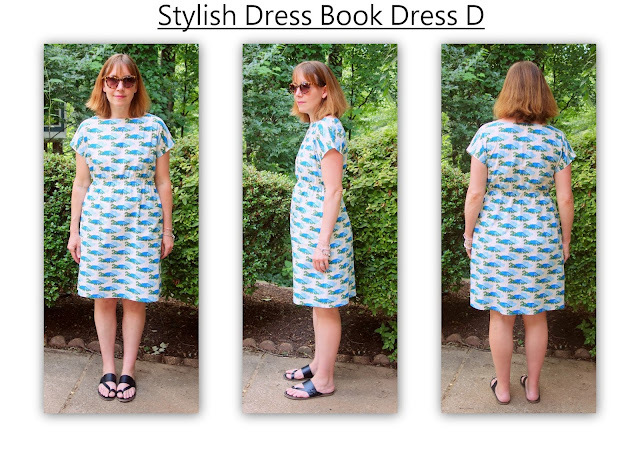 Eventually I settled in on Dress D from the "Stylish Dress Book." This is the cover dress, though mine is altered a lot so it looks different. This pattern is made up in a size medium at the shoulders and bust, and the large at the waist and hips. 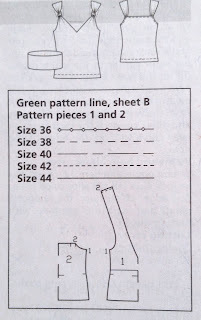 My measurements are technically small, medium, and large from bust through hips, but I had read that these pattern books do run small since they are made for the Japanese population, and in general women there are shorter and thinner than I am. Turns out this particular pattern runs large, and thankfully I read that before cutting mine out, so instead of adding seam allowances, I just traced the medium/large and cut it out on those lines, and used a 5/8" seam allowance throughout. So technically I probably have a small/medium here after it was sewn up. It fits great and all the pieces fit beautifully together. Very nicely drafted. I did add four inches to the hem since I am 5'8" and even with the world's narrowest hem (1/2"), it is still above my knee. These patterns are not drafted for the tall. I didn't want to have a dress with no waist definition, so I decided to add a bit of elastic at the waistline (I used a point *just* above my natural waist--I have a very high waist). I used a bit of bias binding on the inside as a way of encasing the elastic and it turned out well (I will explain more on that in my blog post later this week at my blog). I also chose not to add the sleeves. I really like the way the shorter cap sleeves look on this dress, great for summer. I do think, though, when I make this up without the elastic at the waist, I will add the sleeves. I will likely try that look with a solid color linen or wool, which I think will be both beautiful and comfortable. The pockets are brilliant, and are exactly the right size for comfort. I am so glad I added them. Like on my husband's shirt, I wanted them to disappear, so I made sure to do the same technique when laying out the pattern piece. Okay, that's it for today. I really hope all of you are having a lovely Saturday! Happy sewing and Happy Early Father's Day! Days before I depart on vacation, I had several yards of this beautiful fabric from Fabric Mart (HERE) and no ideas of what to make. The fabric literally spoke to me! I searched and searched through my pattern stash and came across Vogue 1394. I opted to use this pattern as a challenge to my patience. 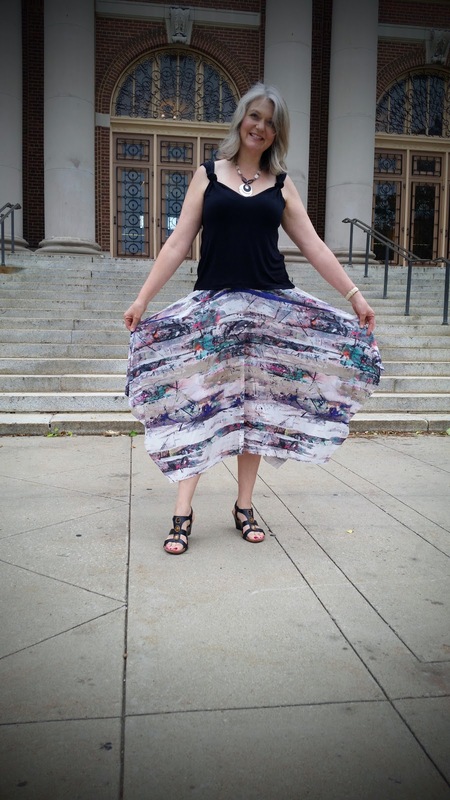 I've had this pattern for quite some time, but as you may know if you follow me, I don't wear dresses that often. I tend to choose those easy and time friendly projects that I can whip up in one day and move on to the next. 1) I shortened the shirt by 2 inches. 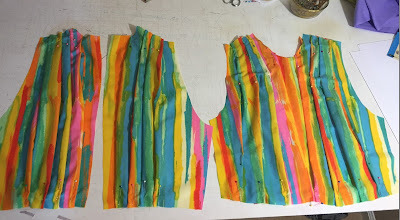 2) I lined the bodice of the dress only. The pleats on this dress alone took me an hour. In all, there are a total of 21 pleats! The remainder of the dress was constructed as per the pattern instructions. I must say, I admired the 6 pieces that constructed the skirt, I might actually use it again for a nice flared skirt instead of the traditional circle skirt. Made by a Fabricista: Sewing for Men...the Joy and Tribulation! Have you ever sewn for the men in your life? Do you have many of them? I have a husband, father, two sons, two son-in-laws and an adorable grandson. That is a lot of men! I decided to create a shirt for them all, except for my father who is probably one of the pickiest people on the planet when it comes to clothing....but that is another story! 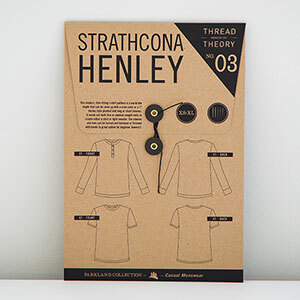 I chose the Strathcona Henley from Thread Theory Designs as my pattern base. I like the slim fit of the top--do you call it a top for a man? Maybe I'll refer to these as a tee shirt with variations. The pattern is described as a modern fitting, or slim fitting tee with neckline variations, sleeve length options, and the opportunity to create a Henley placket if you desire! I briefly asked several of the guys what color shirt they would like/possibly wear if I made them one and they came up with gray or blue. Funny in a weird sort of way! So, I made things easy on myself and ordered 4 yards of gray and 4 yards of navy blue. Both are lighter weight poly blend with good stretch and recovery. I also let each of the choose their preferred style: long or short sleeves, placket or not. I guessed on my grandsons as he is only 21 months and probably doesn't really care as long as it is comfortable. The first shirt I made was for the hubby who wouldn't benefit from a slim-fitting top :). I knew I would have to majorly alter the pattern to fit him. 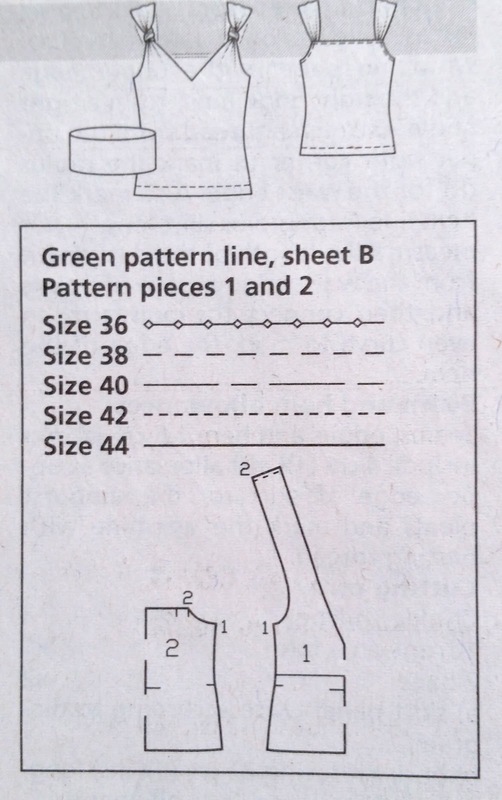 The size range on this pattern is XS to XL. The size on the pattern for an XL is 46-48" chest and 40-42" waist. 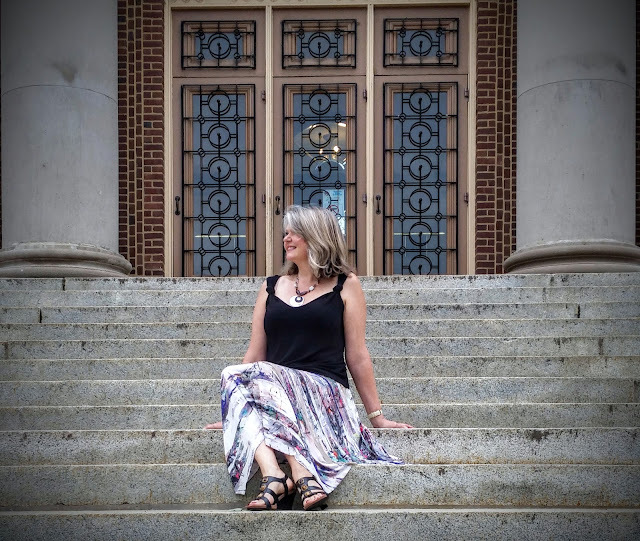 Without telling you his exact measurements, I knew I would have to widen the waistline by at least five inches so I added three inches to each side starting under the arm and ending at the hemline creating an a-line shape. I only did this on the front shirt as I was thinking about how for me I have to create FBAs and I only do that on the front of the garment, not the back. He also wanted elbow length sleeves and the crew neckline. Construction is very easy and intuitive for this top and the instructions are really very good! A beginner could tackle this with the right fabric and a good set of measurements--which in hindsight means more than just the chest and waist. You also need to measure neckline length and depth, shoulder area and sleeve length. 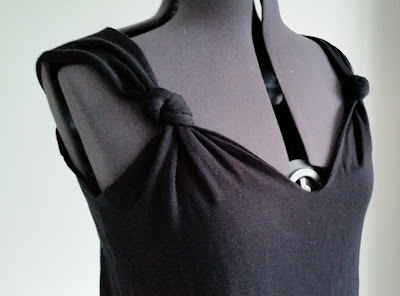 All the necessary steps are in place for this pattern--such as stabilizing the shoulder seams. Have you ever watched a guy pull off a shirt? Not at all like I do which is carefully.They just grab the back of it by the neckline and yank. I made sure to sew a stretch stitch everywhere and I also topstitched the seams just to keep it from falling apart in the future. My first go for the hubby didn't receive the reaction I was hoping for--he HATED it! He didn't like the lightweight fabric and he prefers his tops loose, not a slim fit as the pattern calls for. I had him get a tee from his closet that he likes the fit of and I found a heavier all cotton knit from my stash, also purchased from Fabric Mart, and drafted my own pattern for him. Success! I have his approval now yay! Next up was Daniel, my youngest. He isn't a big guy. His adorable wife makes him eat as he forgets! No wonder he ended up with the smallest shirt--next to the grandson of course! Daniel needed a small shirt. His chest is 36.5" and waist is 31.5. He is always cold so he asked for long sleeves and in blue, just like dad! He also wanted the shirt to look like he was wearing a short sleeve top over a long sleeve so could I put gray long sleeves there as well? Of course I can! In the photos, he is wearing Kevin's shirt but holding his shirt. Why? No idea but that is what he wanted to do so I rolled with it. Andrew, my oldest son, is the only guy requesting a placket. He asked for gray and needed a medium as his chest is 40 with a 34 waist. He is about 6'2" and I also measured the sleeve length for him as I was concerned it may be a little on the short side. The placket directions for this tee are very interesting and drafted pretty much like what I imagine an engineer to draft a placket like. It isn't difficult at all but there are a few steps that do help you get a very nice looking placket. My only regret with this is that I wish I would have interfaced the placket area on the shirt itself as with this lightweight knit, it isn't the best placket I've ever made but it will do for Andrew. Kevin and Daniel are almost exactly the same size with Kevin's chest being an inch bigger but with the same waistline. He lives in Baton Rouge so I knew that he'd rather have a shirt a little bigger than smaller with all the heat and humidity present. I went with a medium for him. He too wanted gray with short sleeves. I had a little mishap with his top and as I was trimming threads I accidentally cut a small hole in the sleeve. Did I mention his was the last make of six shirts? I just about cried but then remember that Thread Theory includes an awesome little label for your shirt so I stitched that over the slit and now it is a cool design element. Brad, or son-in-law #2, needed a large with a chest of 44.5' and a waist of 39.5. He is a solid guy and so is his son, my adorable grandson, Simon! Simon's shirt was a mashup of the blue and gray and I used McCall's 6683. I'd made the romper for him before and knew the pattern would fit. I just left off the collar but kept the stand. Simon measured 20" chest and 21" waist. I asked his mommy if she wanted another onesie for him and she said no, simply because he occasionally likes to play with his belly button. Oh the joy of being less than two years old! It was interesting and fun to sew for the guys in my life. They are just as picky when it comes to fit, color, fabric weight, and texture. I'd really like to introduce some more color into their worlds but at least I didn't have to make six brown shirts. Gray and blue was at least some variety! Thanks for reading this very long post! Try this pattern from Thread Theory Designs, as long as your man is very slim and doesn't mind a clingier fit. It's well drafted and looks good on a smaller sizes and shapes--as long as you aren't out of square--meaning your waistline is larger than your chest! I'll make more of these if they ask, or maybe I'll just make more and give away to all these guys!